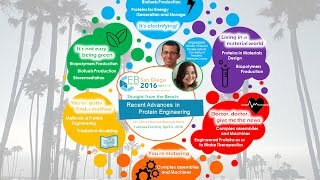 NEW ASBMB PROGRAM at EB2016! New this year, ASBMB’s Program Planning Committee turns over the reins to our graduate and postdoc member-organizers for two exciting sessions at the annual meeting. Straight from the Bench sessions reflect new and emerging topics of great interest to these young scientists and we’re sure they will pique your interest too! In addition to the talks from our organizers’ keynote speakers, the majority of talks will be selected from the volunteered abstracts submitted by Graduate Students and Postdoctoral Fellows. Both sessions will be followed by a networking reception for continued discussion amongst your peers. We encourage you to attend these Tuesday night sessions to hear great science and support your fellow colleagues and friends. 6:45 395.1 Nearer to Nature: Design and Optimization of Artificial Enzymes. D. Hilvert. ETH Zurich. 8:50 395.3 Controlling the Rate of Energy Transduction in a Protein System through Coupling Pathway Redesign. C.J. Wilson. Yale Univ.